So here it goes. I’ve got a tutorial for everyone; a how to dye wool tutorial. To be perfectly honest, I wasn’t simply born with this all important knowledge. I found this information at eHow. However, I thought that adding some pictures and possible variations to the instructions might help out anyone trying to dye their own wool. This is not the only way to dye wool; however, I prefer this method because it is a safe, non-toxic way to add colors to your felted projects. I should note that heat is required to affix the colors to your wool. I did this in two ways. The cooking pot way uses the stovetop and the casserole dishes use the oven. So decide what your preferred method of heat will be. I performed both the stovetop and oven methods, so that I could make more at once. Okay, now we can begin the messy part. Start by pulling a large tuft of wool out, place that wool in a bowl or casserole dish. (Remember the bowl is for the stovetop method later and the casserole dish is for the oven method). Next we make our vinegar solution, the proportion is 1 quart water to 1/4 cup vinegar. Pour this solution over your wool. Make sure you pat the wool down into this solution and get it completely colored. Once all your wool is soaking in this solution, let it set for about 2 hours. This is a process people. Be prepared to have your kitchen taken over if you are making a few colors! Next pull out your trusty food coloring. I am making 8 different colors. Only seven are displayed, because the brown I am making a darker and lighter brown out of. Fill a measuring cup or glass with warm water and add some food coloring of your choice. If you want a deep color, add a lot of it. If you want a pale color, just add a bit. Then stir the food coloring until dissolved. 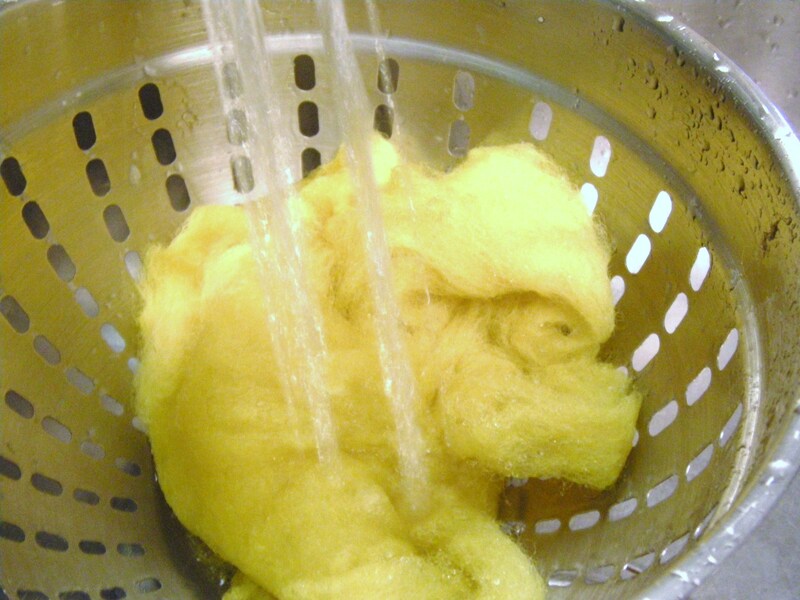 If using the OVEN method simply pour the warm colored water over the soaking wool. Stir the edges ever so slightly to move the color around. Make sure the color is covering all the wool. If the color does not cover the wool, just make up more color mix and add some more. Then place the casserole dish in the oven at 250 degrees for 1 hour. If using the STOVETOP method, pour the excess vinegar off the soaking wool and into a pot. Then pour the warm colored water mix into the same pot. Bring the pot to a boil, and then add the wool. Let the wool heat for half an hour or so. Be careful, with the food coloring. I went a little crazy and decided my hands were excellent utensils and just look what happened! After your wool has heated for the time listed above, it is time to check it. This part is fairly easy. Simply pull a little wool away from the edge of the vessel and look at the liquid in the pot/casserole dish. If the liquid is clear, the color has been completely absorbed and your wool is finished! If it is not clear, more heat is needed. For the OVEN method, up the heat to 350 degrees and heat for 30 more minutes. For the STOVETOP method, simply keep the pot heated for 30 more minutes. After this time, the wool will most likely not absorb any more of the color, so consider the wool finished. In the pictures below, the purple wool is not ready and the yellow wool is. Once the wool is colored. Turn off the heat and allow it to cool in its vessel for about 20 minutes. Then pull out your trusty strainer, pop your wool in and run cool water over it. This step is to get that vinegar smell gone, as well as to rinse off any color that didn’t take. Once the water coming out the bottom of your strainer is running clear, the wool is ready to dry. Just ring it out carefully, and place on a towel. You may have to swap the towel out after a few hours, as it gets pretty damp. Let it dry overnight, or possibly longer. Once your wool is dry, if you notice color is coming off your wool and onto your hands(this is especially the case with black), simply rinse it again and let it dry. The black color, I dyed a few months back, took me days to get right! Well that’s it, it is actually very easy. Your kitchen will be occupied for a while, but most of the time involved in this process is “waiting time”. So just be patient, your wool creations will be better for it! Now, I have a myriad of colors to choose from for my next projects.